I asked Bytes what kind of birthday cake he wanted. None, he says, but I do have a recipe you could make instead. 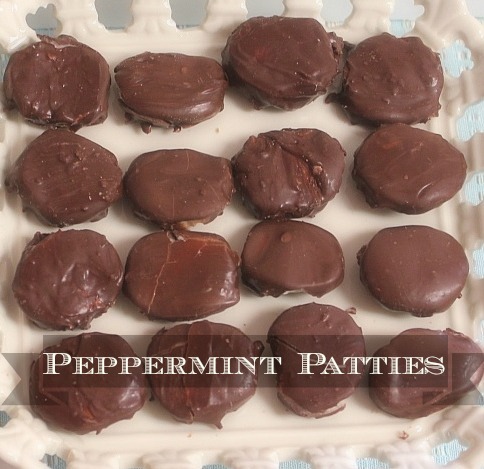 He disappeared into that mysterious office and popped back with a recipe for peppermint patties. You know the kind that makes your breath arctic fresh and makes little hand drawn pictures swirl around your head. Easy peasey! Ummmmm —- w e l l l. You know what they say about not judging a book by its cover? Well, you CAN judge a recipe by its brevity. A list of ingredients is good. A few instructions are good. Some detail in instruction is even better. But handholding is greatly underestimated. The directions for this recipe said “Mix. Form log. Chill 45 min. Cut and dunk in chocolate.” The one I’m giving you below — that one includes hand holding! I used the mixer to make the filling. Went exactly as expected and came together beautifully. I laid out a piece of waxed paper on the counter and lightly dusted it with powdered sugar. Not in the directions, but I’d made refrigerator cookies in 4-H once. That’s what you do. I took a spatula and pushed the filling around in the bowl until it was all in one piece and shaped like a fat log. Then I lifted it out and rolled it a bit on the waxed paper to lengthen and shape it. Quickly done. 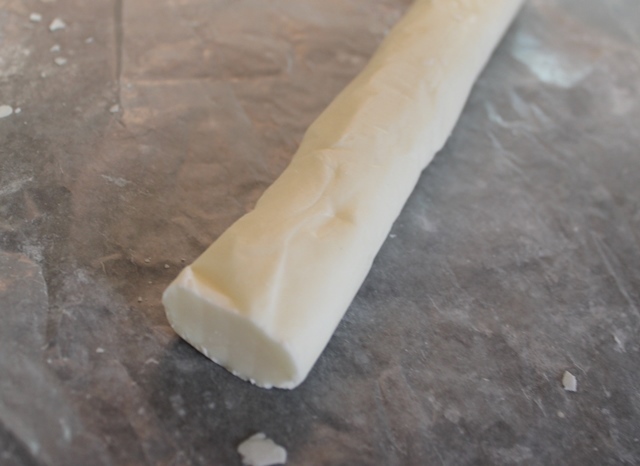 Roll up the filling in the waxed paper and put it in the refrigerator to chill over night. The directions said 45 minutes but by the time I got back to it, I thought a night’s sleep was also important so I over rode the directions. This one actually turned out to be good. 1) It helped “mature” the flavor of two teaspoons peppermint flavoring. 2) Being thoroughly chilled is important to the finished product. Slice the chilled filling into quarter inch pieces. What I should have done – wrap half the slices and put them back in the refrigerator to stay chilled. Repeat: Being thoroughly chilled is important to the finished product. While you are doing that, melt the chocolate coating in the microwave according to package directions. I chose a low flat bowl, thinking it would give me room to work. I ended up with everything squished into one corner to make it deep enough to dip the filling in, even before I got to the last piece shown here. A regular cereal bowl or any microwave safe bowl that size would work fine and keep the chocolate warm, therefore fluid. And deep enough to dip. Put the slice of filling in the chocolate. 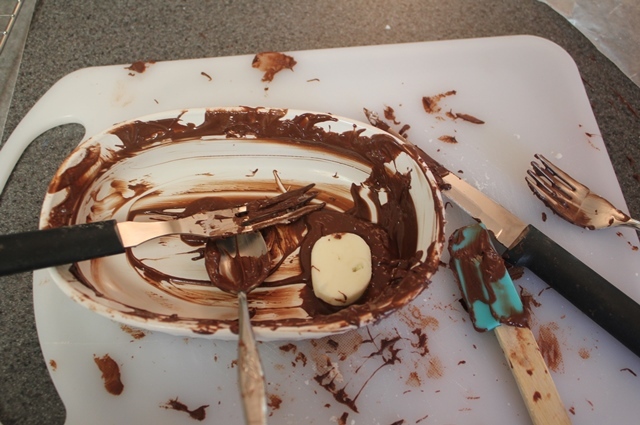 Work quickly to spoon chocolate over the top of it. Scoop it out with a fork, smooth off the excess with the back of a kitchen knife and use the knife point to shove the candy off the fork to its resting place. You don’t even want to know what didn’t work. You also don’t want to know what happens if you dally around taking pictures with the candy setting in the warm chocolate. Or if you put a room temperature piece of filling into the chocolate. Droopage, that’s what happens. 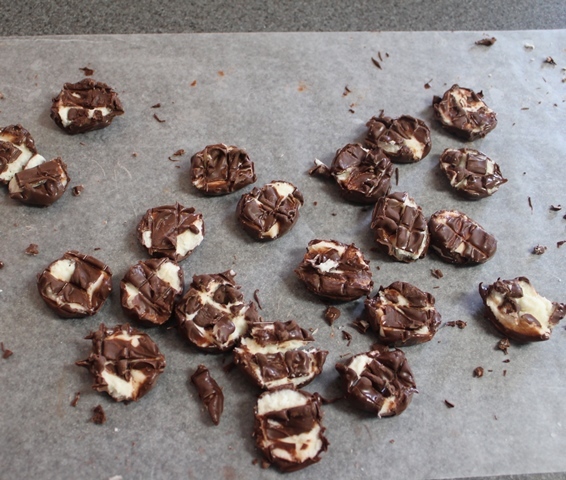 I managed to salvage a dozen peppermint patty mints that look pretty good okay edible from the top. And another couple of dozen that are badly wounded. But I’m pretty sure that didn’t hurt the taste. Actually, I KNOW it didn’t hurt the taste. I kept checking it out. Just for you, of course. A delightfully refreshing mint wrapped in sweet chocolate. Mix the powdered sugar, butter, cream and 2 teaspoons peppermint extract with mixer until smooth and creamy. Place waxed paper on counter and dust with powdered sugar. Use two spoons or spatula to form mixture into an elongated ball in the bowl. Lift mixture onto waxed paper and quickly roll into a uniform log. Handle as little as possible as the heat from your hands will make it sticky. Roll log into waxed paper and chill for at least one hour. Overnight is better. Place candy melts in microwave safe bowl and melt according to package directions. While candy coating is heating, remove log from refrigerator and slice into uniform slices ¼ inch thick. Return half the slices to the refrigerator. 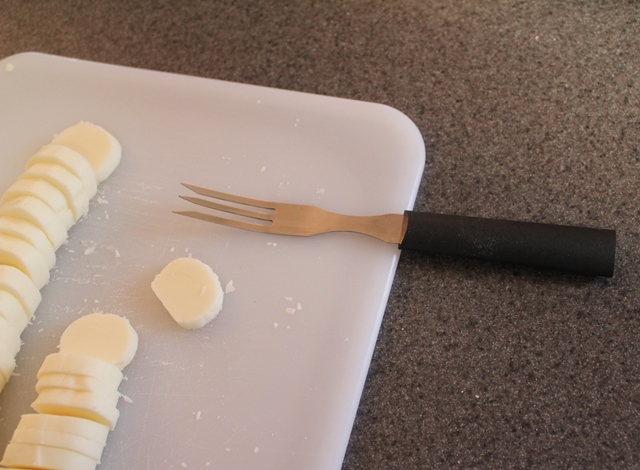 When candy coating is melted, place a filling slice on a fork and quickly dip into the chocolate. Use a spoon if necessary to lift chocolate over the top of the slice. Let chocolate drip back into the bowl for a few seconds, then push the candy off the fork with a sharp knife point onto a piece of waxed paper or parchment paper. Let chocolate harden before serving. I am so glad you stopped by! Follow A Pinch of Joy so you don’t miss a thing! Click the buttons on the header to subscribe by email or RSS feed, follow on facebook or twitter to catch the latest post! If you found this helpful, please share on your favorite network by clicking one of the buttons on the bottom of this post. Oh my! These looks pretty easy to make. 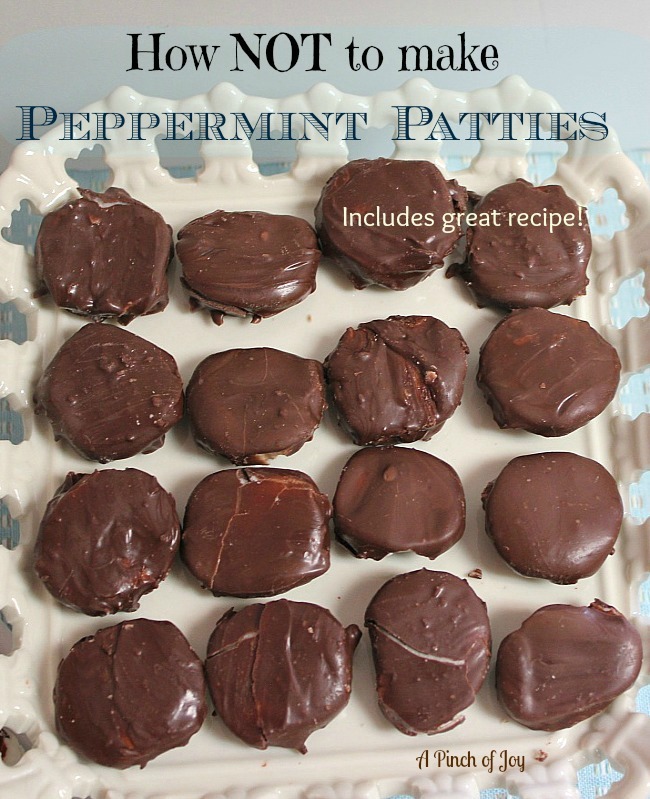 I love peppermint patties 🙂 Thanks so much for linking up to The Gathering Spot this week. These sound yummy! Thanks for sharing on Foodie Friends Friday! Thanks for working out all the bugs for us so we can do it right! 🙂 This looks so yummy and I love peppermint patties! These are my absolute favorite candy so I can’t wait to try these! Thanks! 36 more patties saved from the cooling rack! Glad to be of service — one batch at a time! 🙂 Thanks for pinning! Hi Angela! It took a while to see the humor I will have to admit — but the taste won me over!